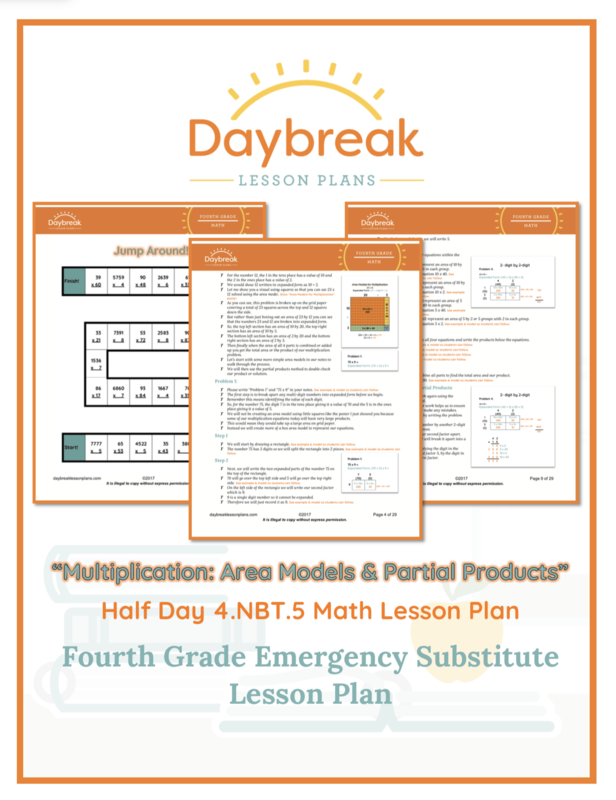 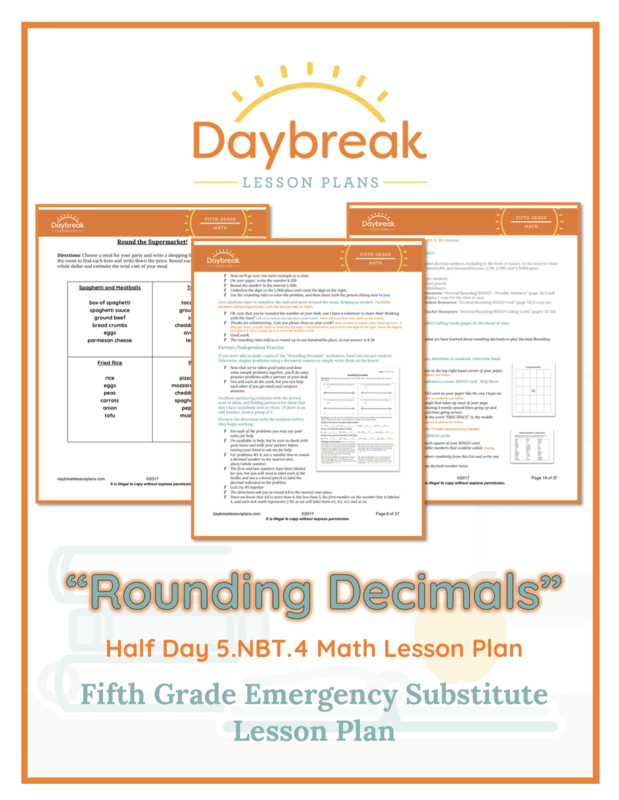 Description: This half day lesson plan is broken down into 2 separate segments (30-60 minutes each) addressing Numbers in Base Ten: Multi-digit Multiplication (4.NBT.5). 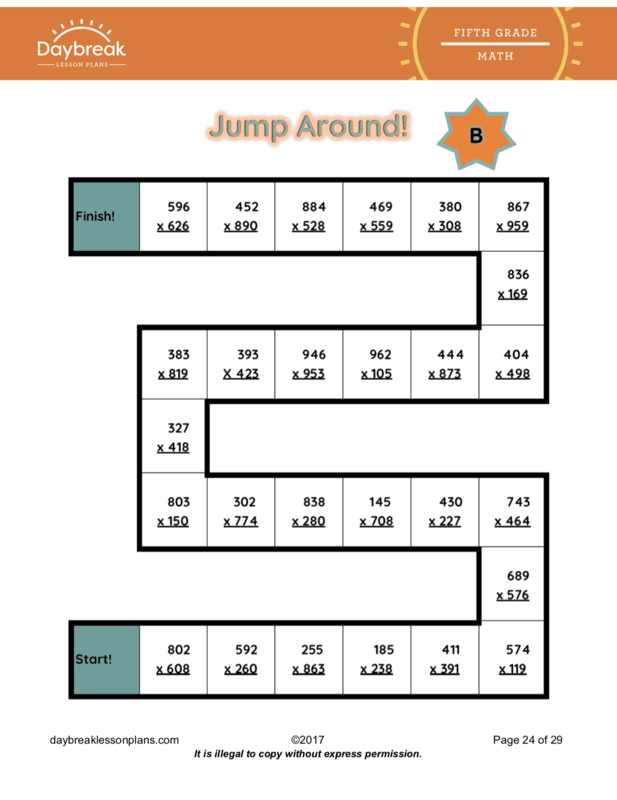 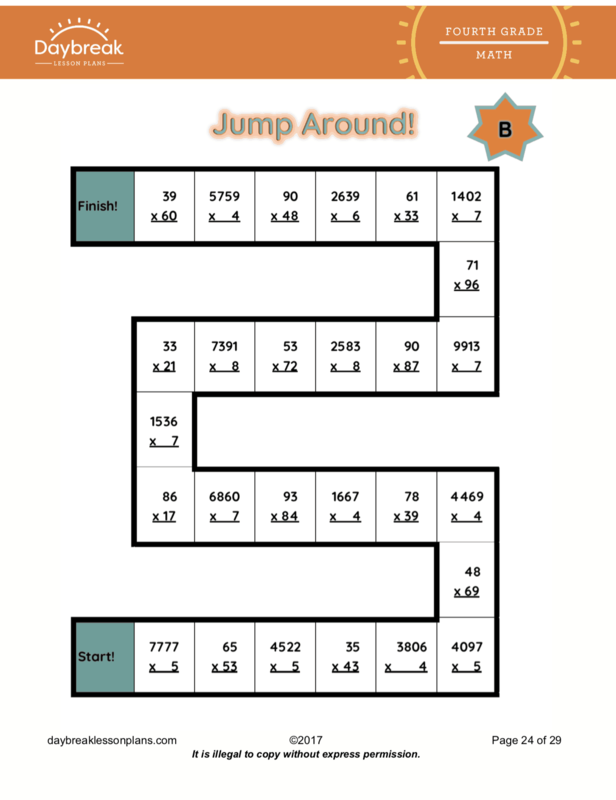 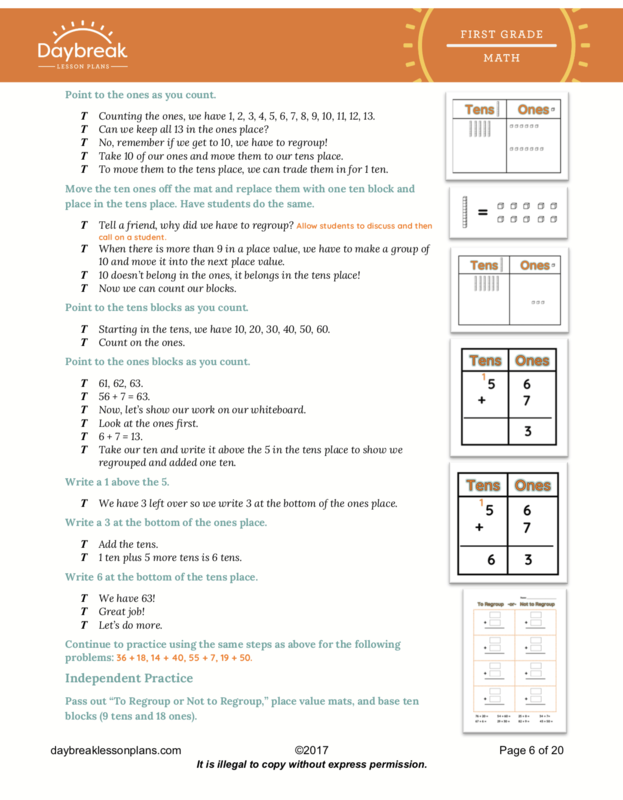 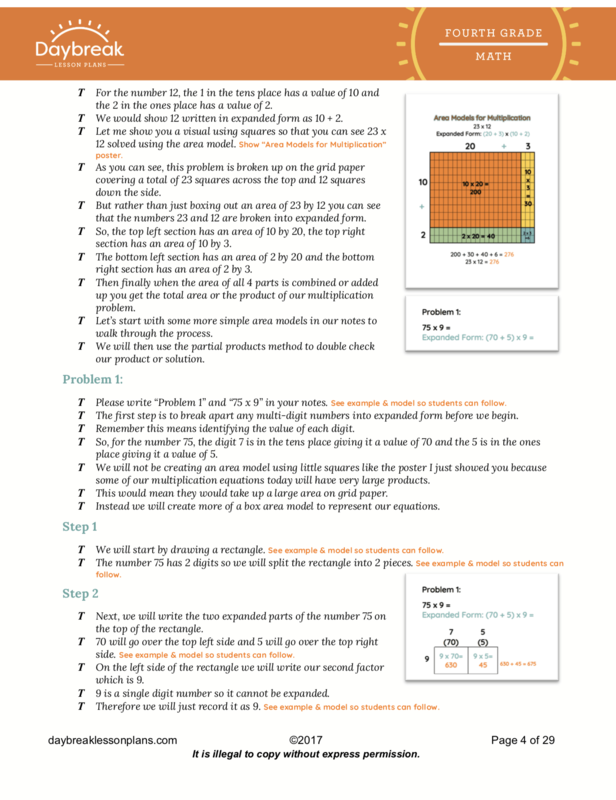 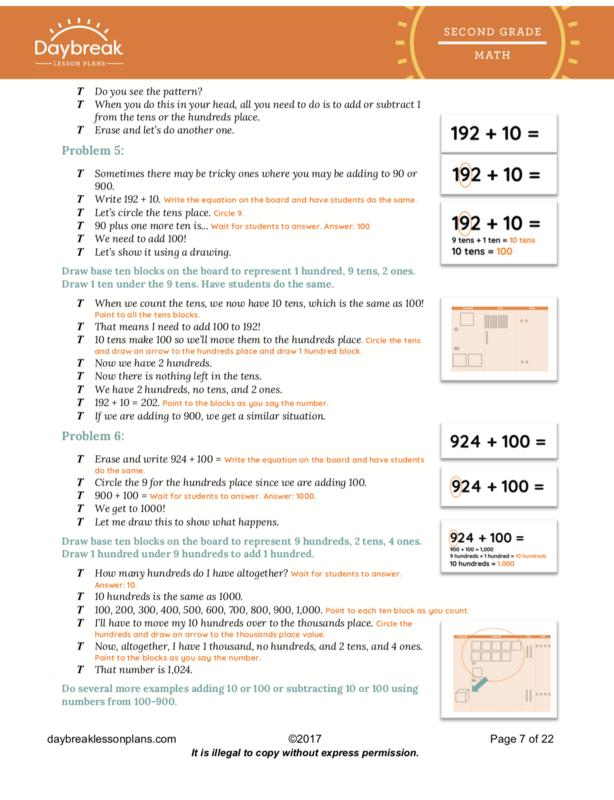 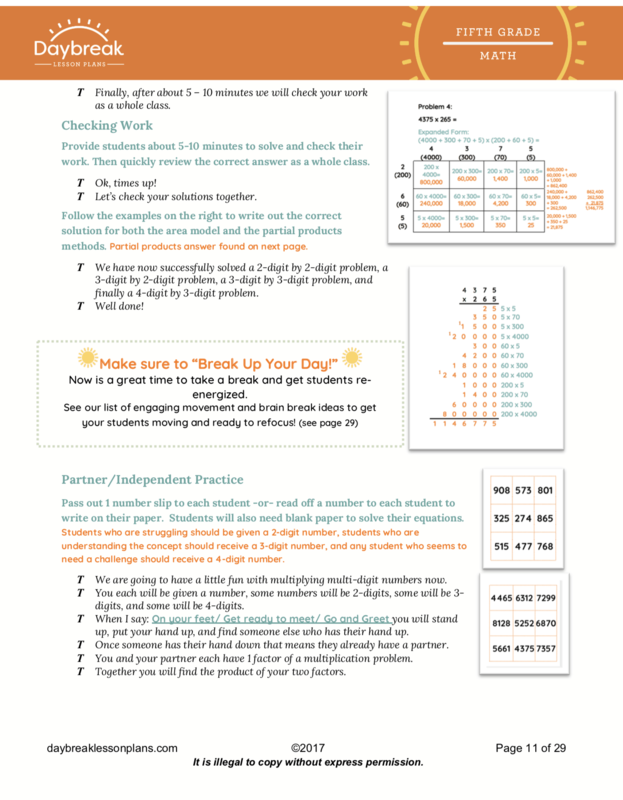 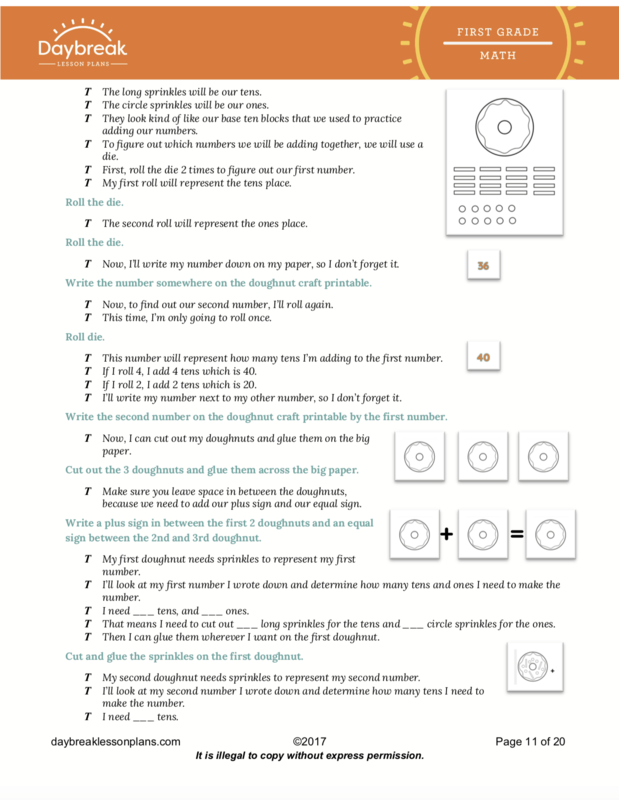 These lessons include: helpful student notes of using area models and partial products for reference, guided and independent practice of multi-digit multiplication, 4-digit by 1-digit, 2-digit by 2-digit, area models, partial products, expanded form , and a game to reinforce the concept of multi-digit multiplication. 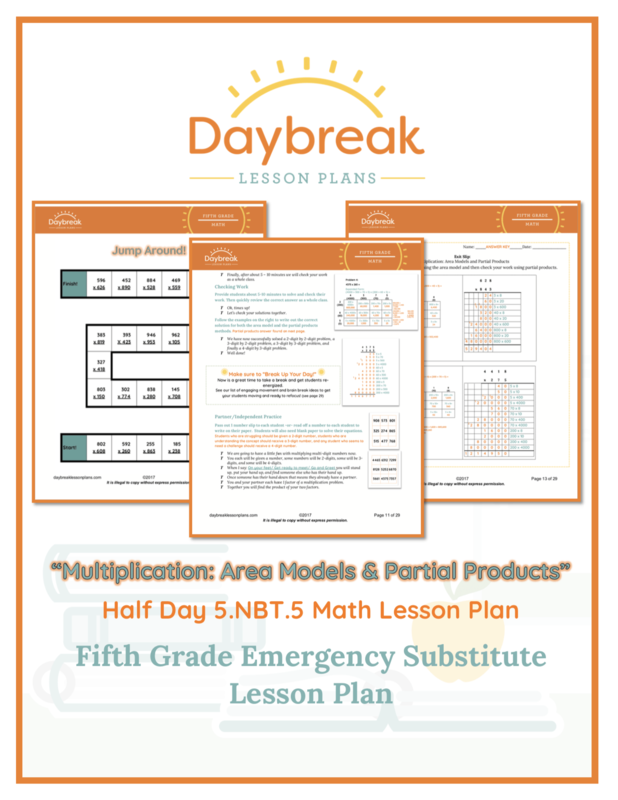 Description: This half day lesson plan is broken down into 2 separate segments (30-60 minutes each) addressing Numbers in Base Ten: Fluently multiply multi-digit whole numbers using the standard algorithm. 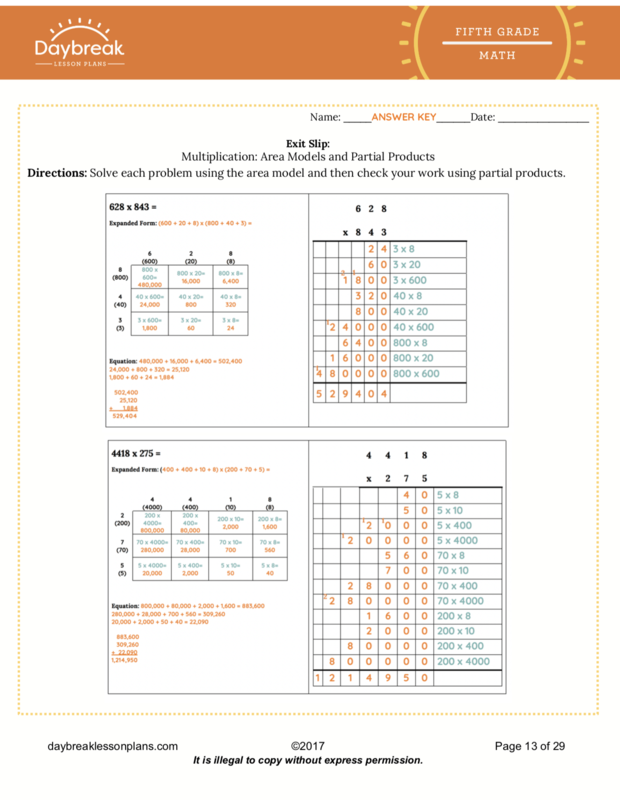 (5.NBT.5). 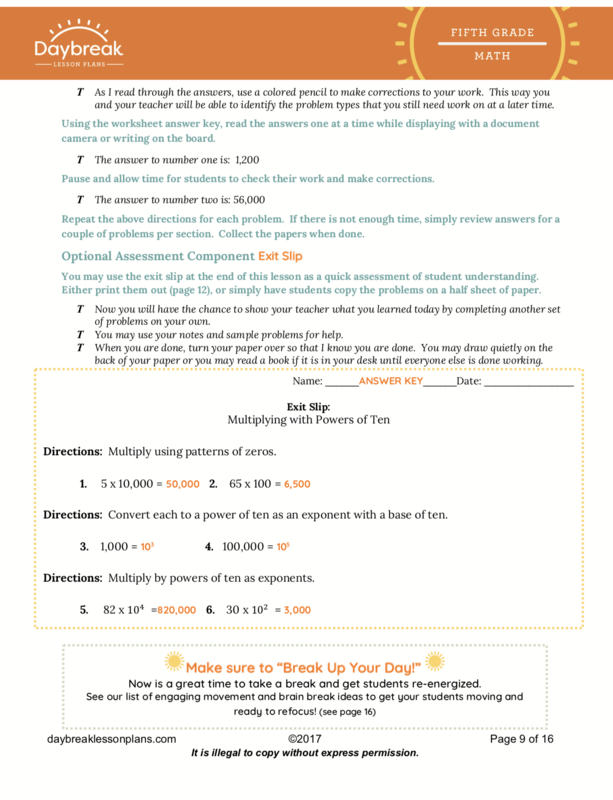 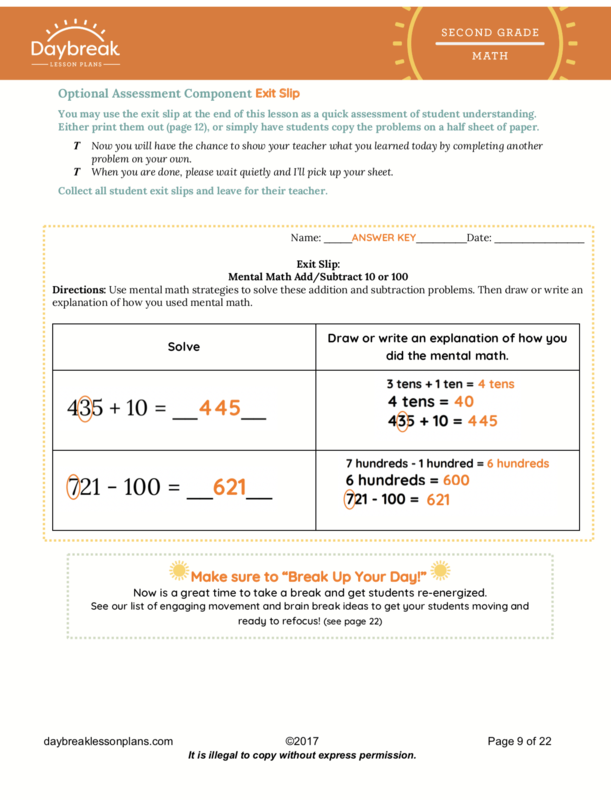 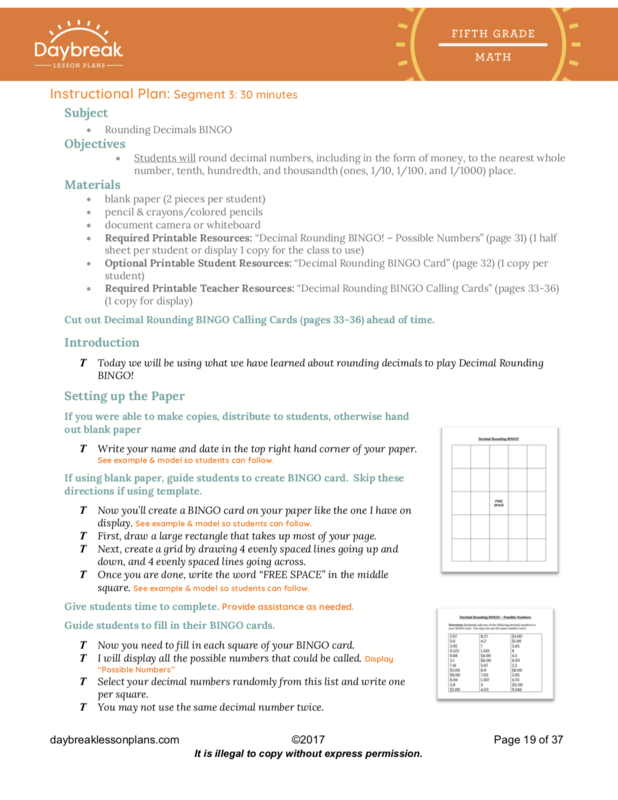 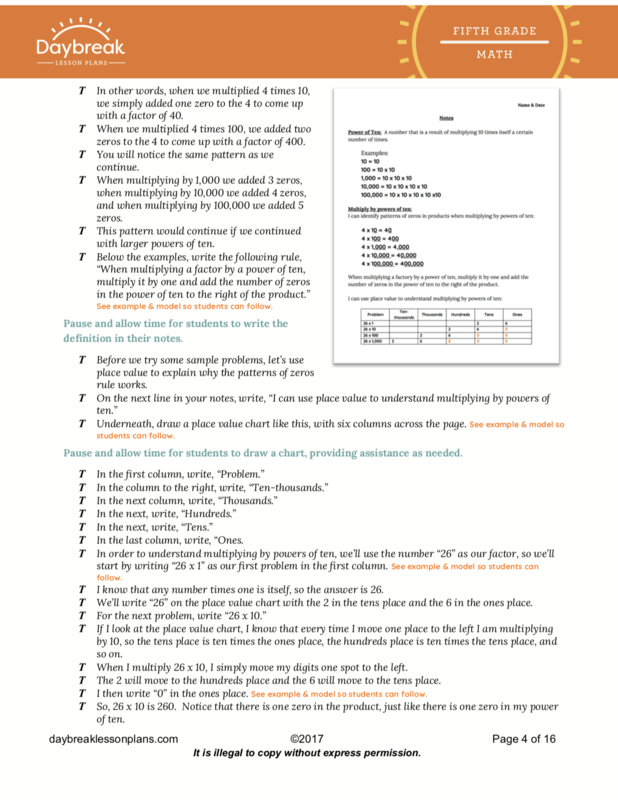 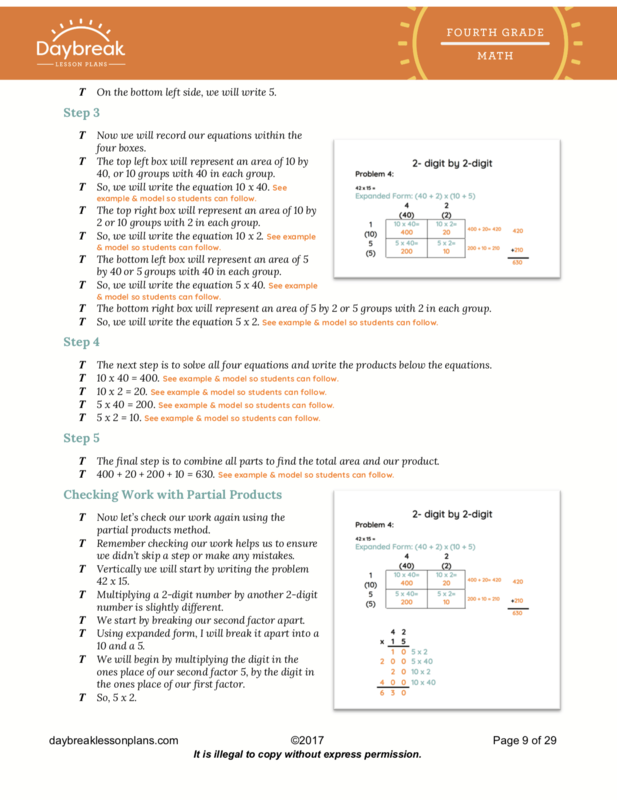 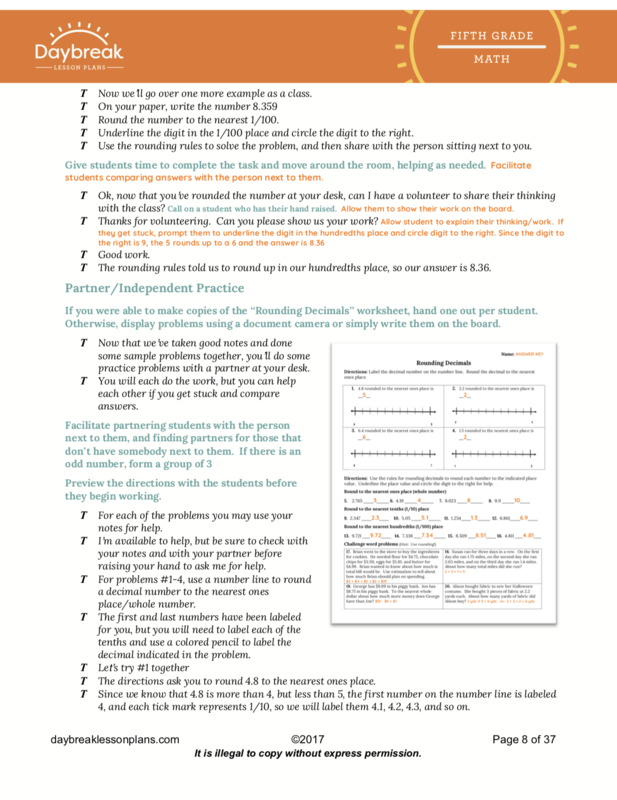 These lessons include: helpful student notes on using the area model or partial products method for reference, guided and independent practice of multiplying 2-digit by 2-digit problems, 3-digit by 2-digit problems, 3-digit by 3-digit problems, and 4-digit by 3-digit problems, and play a game to reinforce the concept of multiplying multi-digit numbers by multi-digit numbers. 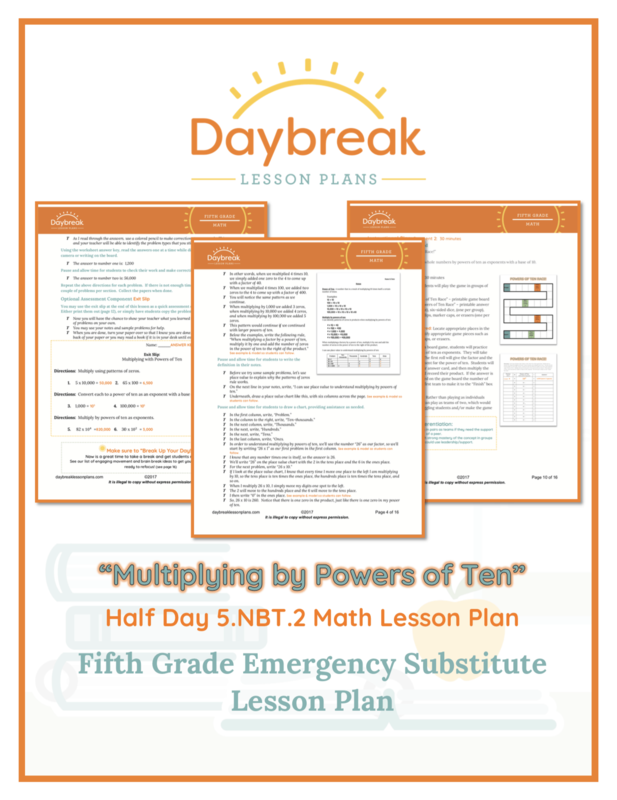 Description: This half day lesson plan is broken down into 2 separate segments (30-90 minutes each) addressing Numbers in Base Ten: multiplying by powers of ten (5.NBT.2). 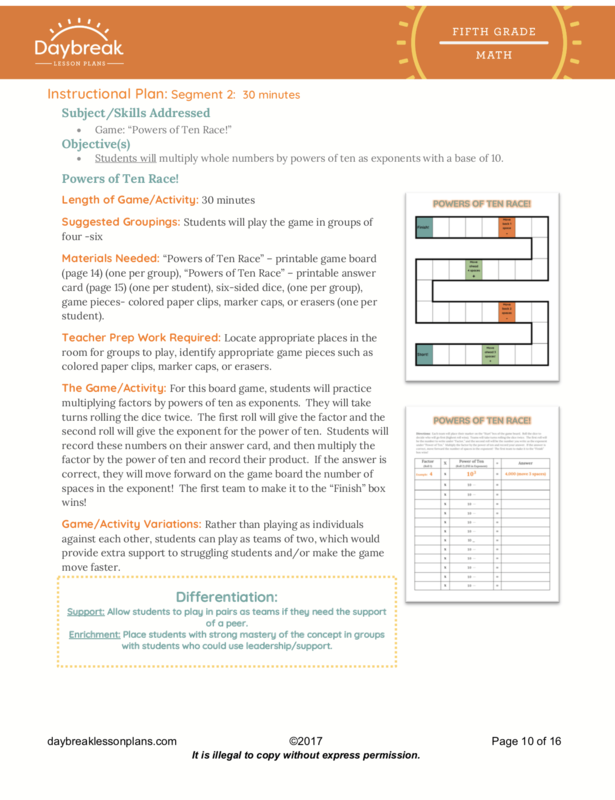 These lessons include: helpful student notes for reference, guided and independent practice of concepts, and a game to reinforce the concept of multiplying by powers of ten. 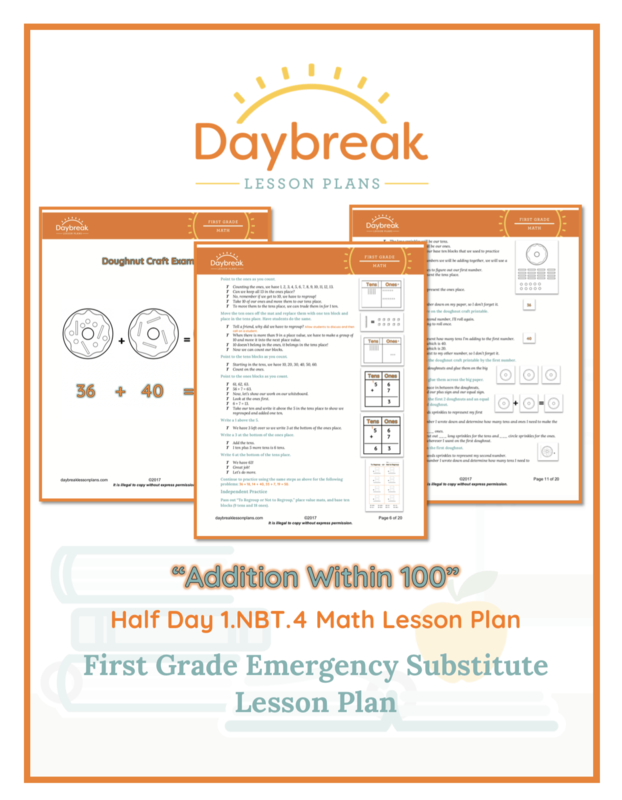 Description: This half day lesson plan is broken down into 2 separate segments (60 minutes each) addressing Numbers in Base-Ten: Addition within 100 (1.NBT.4). 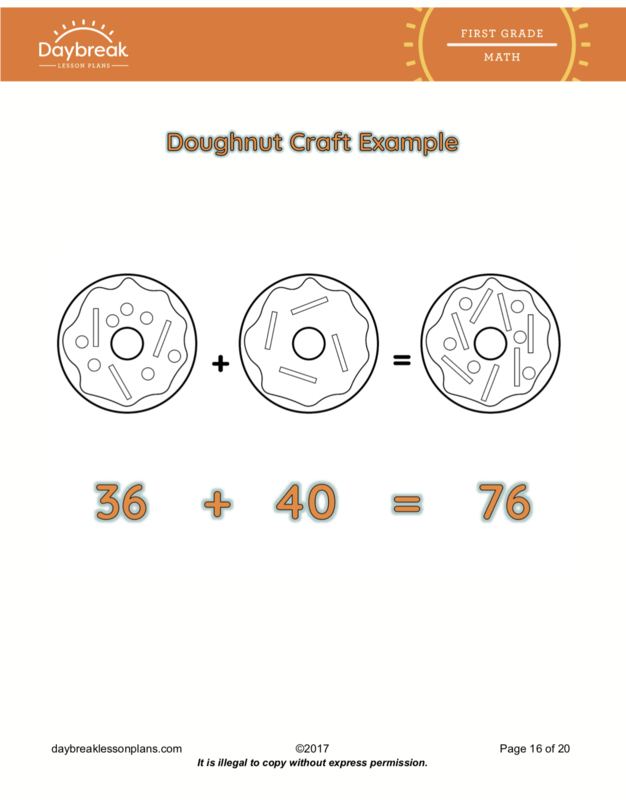 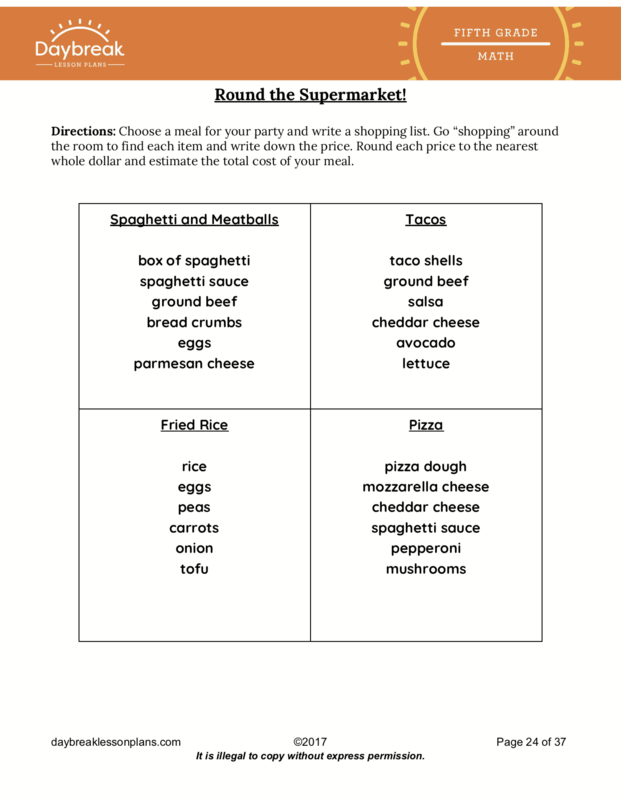 These lessons include: key place value vocabulary, guided and independent practice of concepts, and participate in a craft to reinforce the concept of addition within 100. 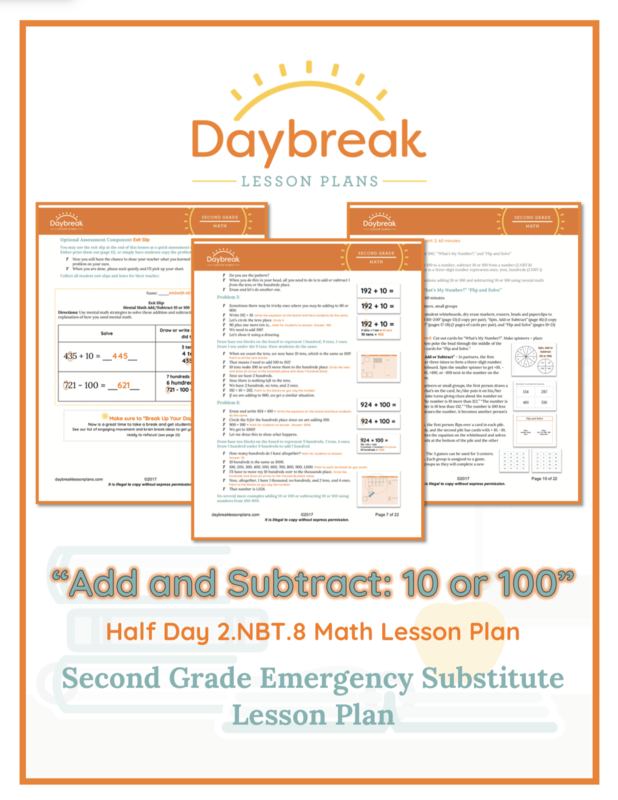 Description: This half day lesson plan is broken down into 2 separate segments (30-60 minutes each) addressing Numbers in Base-Ten: Adding and Subtracting 10 and 100 (2.NBT.1 & 2.NBT.8). 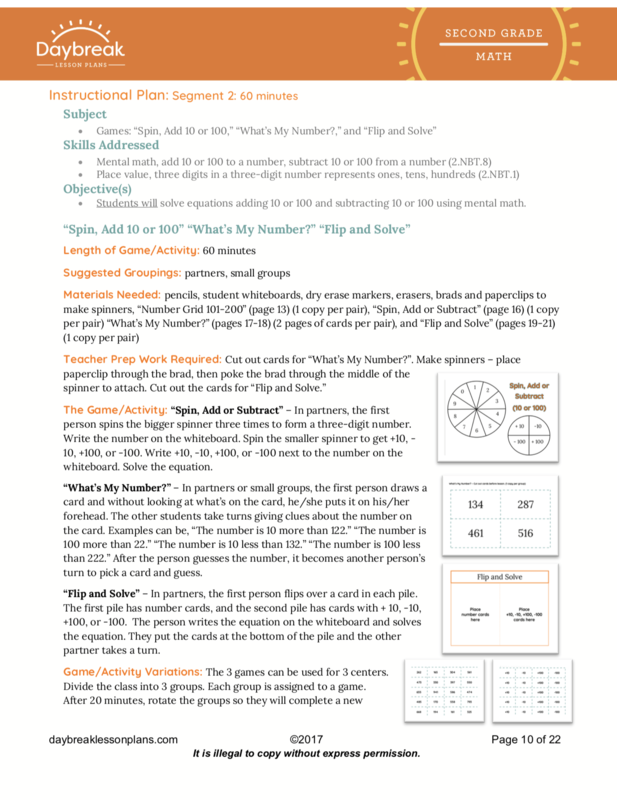 These lessons include: guided and independent practice of concepts, and 3 games to reinforce the concept of adding and subtracting 10 and 100.